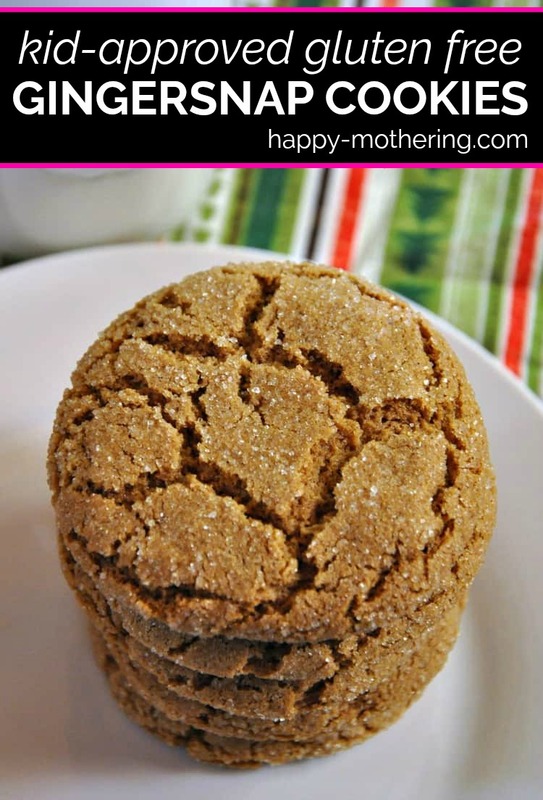 Are you looking for the perfect gluten free gingersnap cookies recipe? This recipe makes crisp, yet chewy gingersnap cookies that even the kids will love! I can’t believe that Thanksgiving is already over, and we’re planning for Christmas already! We put up our tree yesterday, and we moved on from Thanksgiving meal planning to Christmas cookie baking. The girls love this time of year, and so do I. Even though I’m still working, I love slowing down just a bit and taking more time to really enjoy time with my family. We always bake more, do more crafts, play more games and have lots more giggles. I think it’s because it’s snowing outside and we enjoy this special time together indoors. Every year, I like to experiment with new cookie recipes to add to our list of favorites, and I hit the nail on the head with this gluten free gingersnap cookie recipe. They turned out amazing! The girls were eating the dough as we were shaping the cookies, and they both squealed with delight when they bit into the cookies after they were baked. For this gluten free gingersnap cookie recipe, I used Bob’s Red Mill Gluten Free 1-to-1 Baking Flour (this post is sponsored by Bob’s Red Mill). 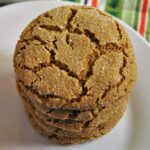 It combines finely ground brown rice flour, sweet white rice flour, whole grain sorghum flour, potato starch, and tapioca flour with just enough xanthan gum to make chewy cookies, which is what I was looking for in this recipe. I like my cookies to have a bit of crunch on the outside, with a soft, chewy inside. Bob’s Red Mill Gluten Free 1-to-1 Baking Flour is formulated specifically for baked goods like cookies, brownies and cakes. The protein in the sorghum flour helps give them an almost wheat-like texture and aids in browning too. I was pleased with how well it worked in this gluten free gingersnap cookies recipe. Get the flour I used for this recipe here. If you’re looking for the perfect gluten free gingersnap cookies recipe, then you’ve landed in the right place. You could always buy gluten free ginger snaps, but mine are better! Are you looking for the perfect recipe for gluten free gingersnap cookies? 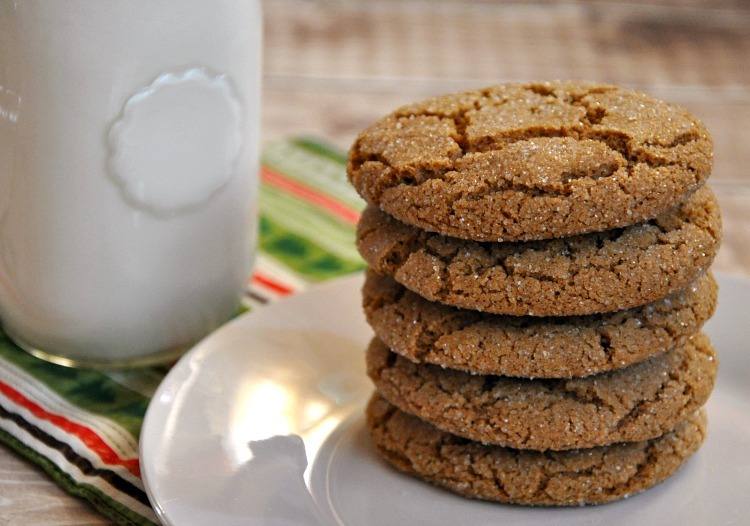 This recipe makes crisp, yet chewy gingersnap cookies that even the kids will love! In a large mixing bowl using a hand mixer, cream the butter, ½ cup of the cane sugar and the brown sugar. Add the molasses and eggs and continue mixing until it’s well combined. Add the ginger, cinnamon, cloves, sea salt and baking soda and mix well. Last, add the Bob’s Red Mill gluten free flour and mix until well combined. The mixture will be slightly wet. Roll the gingersnap cookie dough into 1 inch balls, then roll each ball in the remaining ½ cup of cane sugar. Lay the ball on a parchment paper lined baking sheet. Bake for 15 minutes or until the cookies are crackled and set. Allow the cookies to cool on the baking sheet, then transfer to a wire rack to cool completely. Do you like gingersnap cookies? What are your favorite gluten free cookies to bake during the holidays? Could this be made with regular gluten free flour? I haven’t tried the recipe with any other flour. I’d compare the ingredients in your gluten free flour with the flour I used and see if it’s pretty similar. Oh good! Glad to know the gingersnap recipe works with King Arthur flour too! I haven’t frozen the dough. I rarely have time to work ahead LOL. If you do, will you let us know how it works for you? Hi, I made these and they are amazing! Is there an egg free option? Have you tried with coconut sugar? I haven’t, but it should work okay. If you try it, let us know how it turns out! Hi! I just made these with coconut sugar, and they’re the perfect amount of sweetness! I cooked them for 10 minutes, instead of 15, but that could be because I rolled them a bit smaller. Delicious recipe anyway! Great! Thanks so much for sharing your experience. I’m glad they turned out great! I tried this recipe twice & I can not roll into balls cause the dough is so soft, sticky & there is no way I can roll them into balls. Followed the recipe. I can’t roll them in sugar. What did I do wrong? Did you use the exact same brand of flour? Gluten free flour can be really finicky if you’re not super careful. I put my dough in the refrigerator for 30 minutes to firm up between baking one batch at a time. You have to roll them quickly or they will stick to your hands. Definitely! If you’re in a warm or humid environment, you can split the dough and roll it in batches while keeping the rest in the fridge. It turns out great though! This recipe looks amazing. A definite try for this season. I so miss ginger snaps. I’m not Celiac, I HAD an “gluten intolerance ” until 2 yrs ago when a Lyme disease packing tick bit me. After catching Lyme disease it exacerbated the intolerance into a full blown ” wheat allergy”. These ones are really good! I hope you enjoy them! 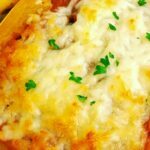 Like so many others, I just made this recipe. Very much like an old recipe I used for years but with the difference of the gluten free flour. I did add some chopped candy ginger I confess, but they would have been great even without that. I am so loving these cookies! Thank you for sharing at Fiesta Friday party! Your Gingersnap Cookies look amazing! Hope you have a great week and thanks so much for sharing with us at Full Plate Thursday. I found this recipe only recently and I just wanted to comment that with the soft dough I used a cookie scoop and dropped the cookie from the scoop right into a shallow dish of sugar. I then covered the cookie ball with sugar and carefully lifted it out and put it on the parchment lined sheet and although the dough balls were not perfectly round the cookies spread as they baked and formed nice looking cookies. I did not chill the dough or the dough balls. Turned out great! Used King Arthur GF flour, added a few extra spices (small amounts of nutmeg, allspice, cayenne and black pepper), a splash of vanilla and baked for about 13 minutes. Wonderful cookies! I did not get the cracked tops but if I left them in the oven for a bit I’m sure they would have. Highly recommend putting the dough in the fridge for about 30 min to get firmer cookies — also may not spread as much if you chill the dough. Thanks so much for the feedback. I’m glad you enjoyed them! Hi. Thanks for the recipe. Can I make them without eggs? I haven’t tried making them without eggs. If you try making them with an egg substitute, let me know how they turned out. I had to refrigerate the dough in order to be able to roll them into balls. Unfortunately, the tops didn’t crackle like they should and they were very pale in color so you can’t even see the sugar on them. These turned or very cakey rather than like a chewy cookie. Yummy tasting, but not at all like the picture or what I was expecting. Did you use the same brand of flour? Just a bit of feedback… I made these cookies with Superstore Gluten Free flour and Wholesome organic molasses (which is more viscous to other brands I used pre gf) and they turned out very wet and spread a lot. Next time I might add more flour or use half my bought blend and half white rice flour as the S. store blend is quite potato starchy. The flavour is great and I love that they’re a one bowl cookie, so I’ll be trying it again with some modifications. Thanks for the feedback. I definitely find that the Bob’s Red Mill 1-1 flour is drier and denser than some other gluten free flours I’ve tried, so I think it may absorb more moisture. I haven’t worked with the brand you used. I made these exactly as directed and they were amazing!!! Although they did not look like the pictures the taste and chewiness was perfect. I love these cookies, they were easy to make and my kids do love them. These spread into one huge mass on my cookie sheet. Used Bob’s gf flour. Not happy with these at all. Did you use melted butter instead of softened butter? That’s the only thing I could see making these runny.